Thunder Bay Press, 9781626863262, 76pp. Provide hours of fun, this kit will. An out-of-this-world crochet adventure, the Star Wars Crochet kit offers a fun and interactive experience by including a full-color paperback book with step-by-step instructions for crocheting Star Wars' most memorable characters, plus yarn, a crochet hook, a needle, stuffing, and safety eyes. 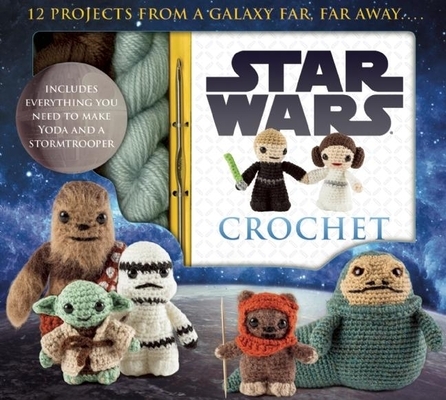 With instructions for twelve different characters and enough materials for two complete projects -- Yoda and a stormtrooper -- your crochet collection can also soon include Luke Skywalker, Darth Vader, Princess Leia, Jabba the Hutt, and many other favorites. Use the force of crafting to create this amazing cast of characters with Star Wars Crochet.